Our water extraction with centrifuges comes with ultra modern facilities, high performance, high capacity and above all at very economical rate. This is the result of our immense experience and dedication in the field of manufacturing laundry machines and garment finishing equipments. The range of our water extraction machinery includes Hydro Extractor, Carpet Hydro Extractor, Three Leg Suspended extractor and other related machinery. We are known in the industry for supplying quality products and are amongst the few suppliers for these machinery who can supply in bulk quantities in limited time. 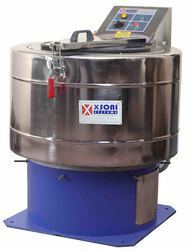 XSoni systems hydro extractor is specially designed for centrifuge of garments after washing/dyeing. This hydro extractor is used as water exraction machine and als in various garment industries for water extraction. Stainless steel inner basket & outer drum, self balancing suspensions ensures vibration free and noiseless operations. The high speed of drum rotation ensures shorter time and consumes less energy. Available in 15, 25, 50 kg. Dry weight per charge capacity. Suitable for garment export industry, hosiery dyeing industry, all types of textile industries, laundries of hotels and hospitals. The complete machine is suspended by heavy duty three legs on universal oscillating steel pins with heavy steel springs and gun metal bushes. This arrangement removes the vibration while the machine is running. 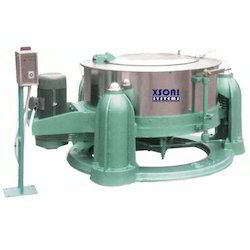 This is used as water extraction machine and washer extractor.